Get the best qualities of a folding pocket knife and a fixed-blade ninja karambit with this unique hybrid design! This folding Karambit Klaw knife features a 3” blade with a fiercely sharp curved edge and piercing point. A quality assisted-opening mechanism propels the blade into the locked and open position when you engage your choice of either the thumb stud or blade spur. The nylon and fiberglass reinforced handle has the shape of a fixed-blade karambit, complete with the open thumb hole pommel design. It folds to a compact 5 in. in closed length. The knife arrived fast and looks good but the blade is hardly as sharp as I wish it would be when it arrived with also the belt clip being just not good enough and hard to attach the knife to me. But all in all this knife is good for its price and reliable. This knife is really cool looking, I mean come on, look at it! It didn't arrive razor sharp, but it sharpens up pretty well and I'm just using a little pull sharpener. The seat belt cutter thing(?) isn't sharp at all, plus that looks like it's attached to the knife with a plastic hinge, I have a hard time believing it'll go through a seat belt, although it's only one screw. Other than those issues the knife is pretty solid, specially for the price! It does stick out of your pocket a lot, but then again it's not a subtle knife. Solid knife, arrived quickly and razor sharp. Would recommend. This knife is well made and fits to its use nicely. I recommend it. I love this blade. A little on the slow side with the release, but it's a fantastic little knife. I was actually surprised that it arrived as quickly as it did, since my mail system here is slow, but it was quite fast. I would buy this knife again and again and again if I could. Love it! It looks so angry and arrived razor sharp. It also has that seatbelt cutter (at least that's what I think it is), which is a cool addition, but not really sure why it is there. My only problem is that the one I got does not always fling all the way into lock position. It all depends on the angle of opening it for me. If I point it down and open it, the blade locks, but sometimes when I do it holding it sideways, it sometimes does not arrive into locking position. Other than that, it is wicked cool. Upon looking at the picture I considered buying this knife. I got half way threw the vid before I was at the cheak out screen. 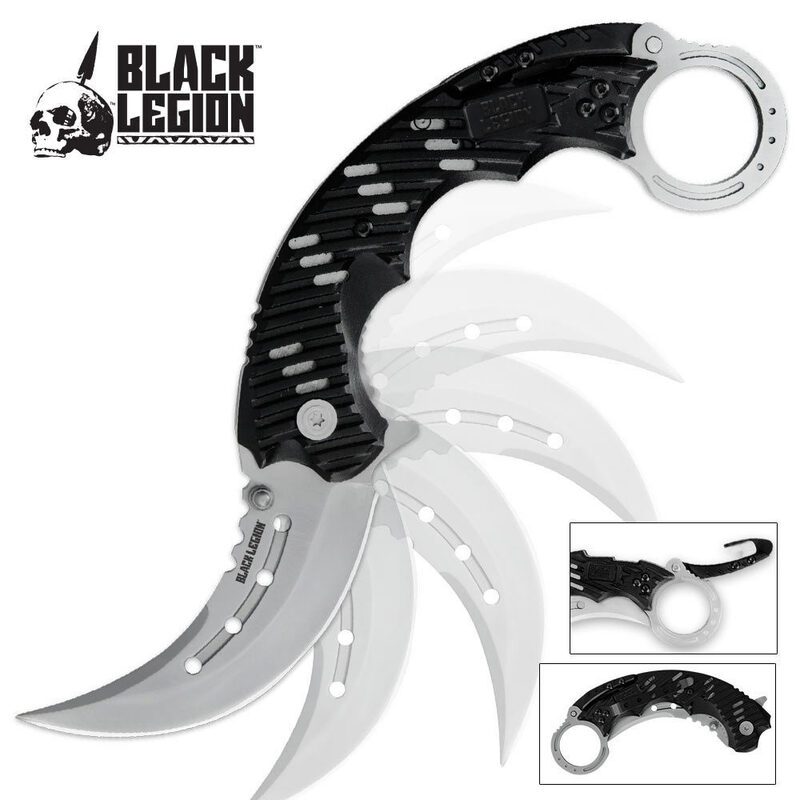 Black Legion put there foot into this Karambit the curve is simply sexi & the blade is sharp enough to reaklessly marvel at the knife in it's full glory.